Women & Beer: Shattering the [Pint] Glass Ceiling, One Sip at a Time. Today’s post comes from guest contributor Sarah. Thanks Sarah! 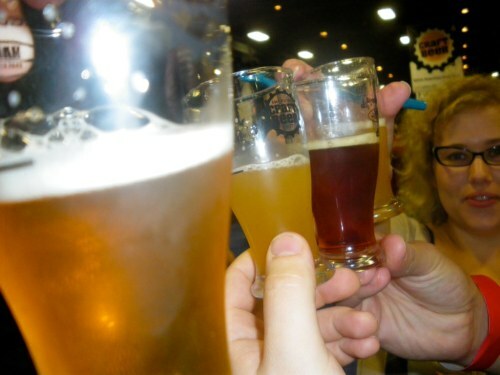 Saturday’s American Craft Beer Fest marked a celebration of all things beer. But as a female beer-drinker, it’s often hard to know exactly how to fit into the “bro fest” that is beer culture. As most commercials will tell you, beer is something marketed to and consumed by men. And while women can certainly be the bikini-clad tools for marketing beer, we just don’t seem to be the demographic that’s drinking beer (unless of course it’s fruity or low-carb.) So we’re left in the margins – either ignored completely, condescended to, or thrown into a wet t-shirt contest. However, the fact remains that whether or not we’re invited into the club, women LOVE beer. The strong showing of female beer fest attendees is a testament to that fact, as are the growing number of women who work within the beer industry. So Beeriety’s Erin and myself made it a point to talk to some female brewers about their sense of the beer community and their place as women in a predominantly male field. During our conversation she also expressed a hope that someday soon, she’d no longer be referred to as a “female” brewer, but instead as simply a brewer. She also turned us on to two organizations designed as networks for women within the industry. The first, Women in Beer is a Boston area group of women in the beer industry who [according to their website] “get together at least once a month to taste and review beers.” The second is the national group, the Pink Boots Society, an organization comprised of women who are employed within the beer-industry (brewers, marketers, owners, journalists, etc.) While any women within the industry is welcome, voting rights within this group are reserved solely for women involved in the physical production or quality assurance of beer itself. The PBS website also provides a listing of all its members and their titles, giving you a good idea of just how many women are situated within this field and just how diverse their jobs are. While the Pink Boots are exclusively a female group, Women in Beer is avid that they are not out to exclude men, merely to make women their main focus. Over the coming weeks, we hope to be able to attend a Women in Beer meeting and discuss with them in greater detail their views on the industry, their goals as a group, and [most importantly] their favorite beers! For now, ladies, we here at Beeriety would love to know what you’re drinking. Twitter your beers using the #mybeer hashtag!